Talk about everything. Describe your actions, where you are going and what you are doing. 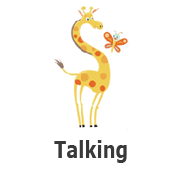 It builds vocabulary, oral language and conversation skills. Have a back and forth conversation with your baby even though they may not talk back. Ask questions, make observations and give baby frequent face-to-face time. This helps build conversation skills as well as bonding time with an adult.